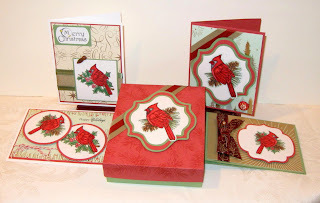 Welcome to the last day of Mark’s Finest Papers, a Heinrich Company’s Christmas in July blog hop! We are so glad that you joined us. We hope that you have enjoyed the tutorials each day and the projects on each of the blogs. Please note, if you are not a member of Speedy TV you will need to join the site before you can view the tutorials. Joining is quick, easy and FREE, just click the tutorial link below and it will take you right to the home page where you can join. The sign up button is on the right hand side of the page. Below are the designers participating in the hop. Some may have a project and some may not. If you visited my blog yesterdy, you know I wasn't 100% happy with my projects. Today is a totally different story. In fact, I am giving it to my BFF for Christmas. She loves anything with pine cones on it. 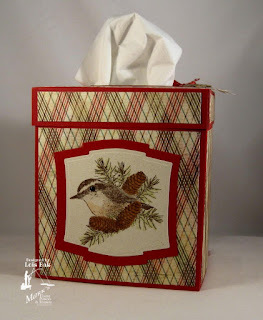 I used two different sets from Mark's Finest Papers, a Heinrich Company, on my tissue box -- Peaceful Nuthatch and New Pines. I do hope you have gotten some creative ideas from the projects we have shown you during this Christmas in July celebration. Thanks for stopping by, and I hope you come back again soon. 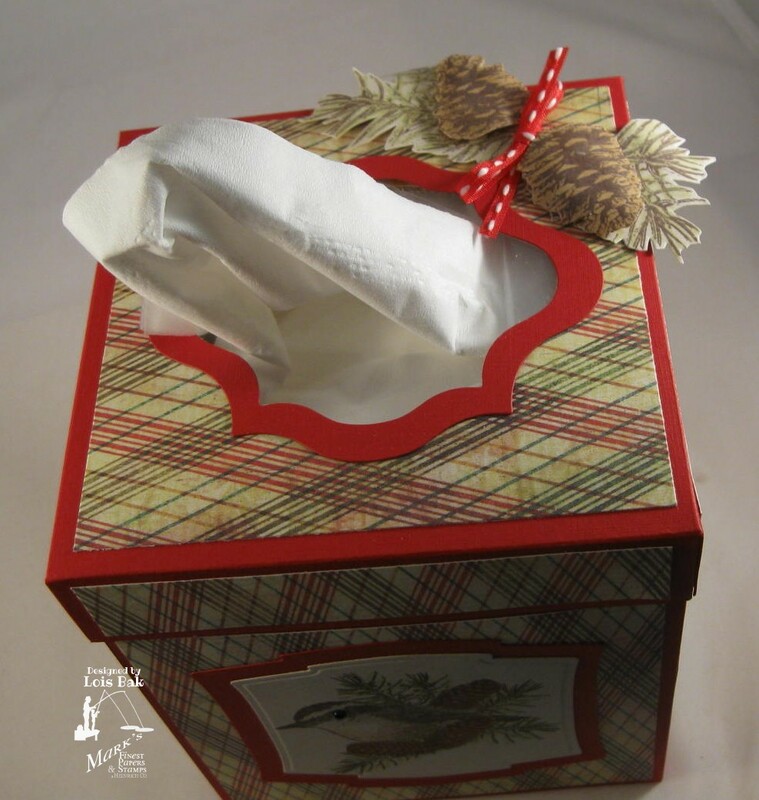 Welcome to Mark’s Finest Papers, a Heinrich Company’s Christmas in July blog hop! We are so glad that you joined us. We hope that you will enjoy the tutorial each day and the projects on each of the blogs. 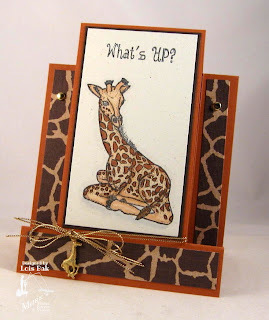 The blog hop is running July 23-29, with a new tutorial and project each day of the hop. Please note, if you are not a member of Speedy TV you will need to join the site before you can view the tutorials. Joining is quick, easy and FREE, just click the tutorial link below and it will take you right to the home page where you can join. The sign up button is on the right hand side of the page. I had the most trouble with today's project -- the Glass Blocks. I envisioned a nice little scene in my mind, but when I transferred it onto the block, it didn't look the same as it did in my head. I'm not sure I got the background painting done correctly. If I ever try this again, I may dab the acrylic paint onto the block rather than painting it on. At any rate, here is my first attempt. So, I decided to try it again -- on the other side, with much the same result with the painting. Be sure to check out the other participants today to see if they had better luck than I did. Thanks again for stopping by today. Tomorrow is the last day, and I hope you'll check out the final project in our Christmas in July celebration. 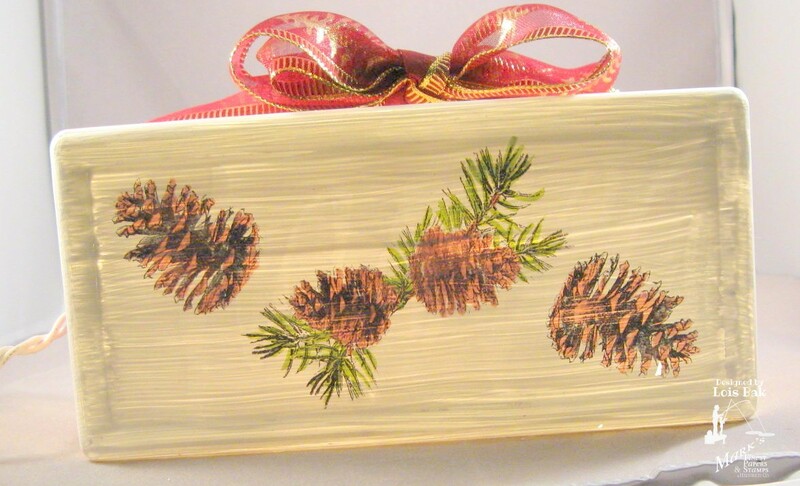 This is my second project for the Christmas in July celebration. I'm not sure I ever used Shrinky Dinks when I was a kid. How did that happen? Better late than never, I always say! 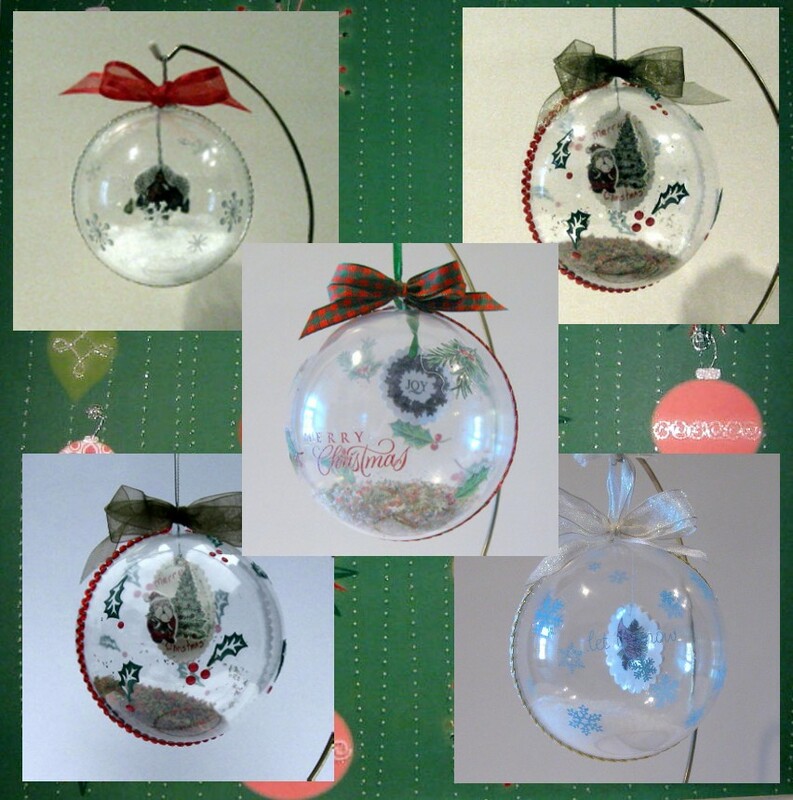 I had a grand time playing with these Christmas ornaments. As you can see I made FIVE of them. However, I did have a little trouble photographing them. When I did it inside, I got reflections from the lights; when I did it outside, I got reflections of the scenery. Click on photo to see close-up. I filled each of the ornaments with Flower Soft. Thanks for stopping by again today. Hope you'll be back tomorrow to see my glass blocks. They were a challenge! 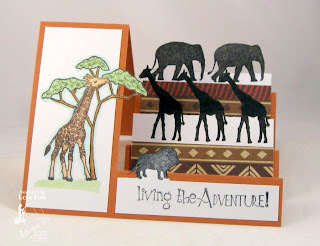 This is my last week as hostess for the CCEE Stampers, and I asked the team to make a Step Card -- either side-step or center-step -- a fun technique. 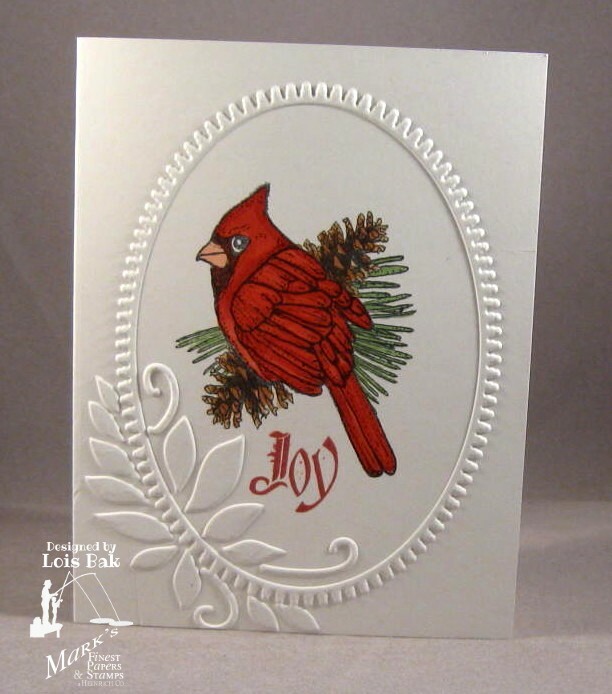 I chose a Center-Step card, using a brand-new stamp set from Mark's Finest Papers, a Heinrich Company, called Above the Rest. There are two giraffe images on this set, as well as several cute sentiments. I just love the sweet face on this sitting giraffe. 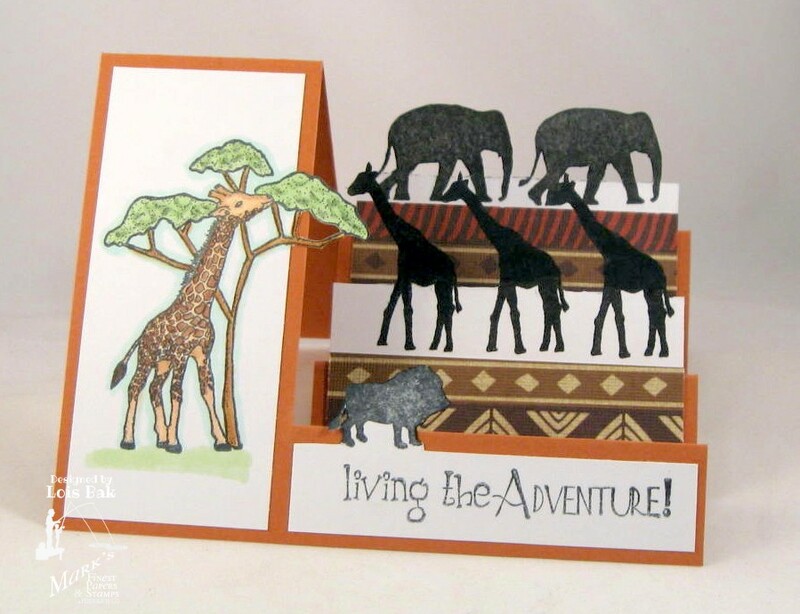 Last year I bought a DCWV paper pack called Safari Chic, which has some great African prints in it. Fortunately one of them was a giraffe pattern. I added some gold twine and a little gold charm, and I was finished. The CCEE Stampers would love for you to play along with us. Come visit our Blog. 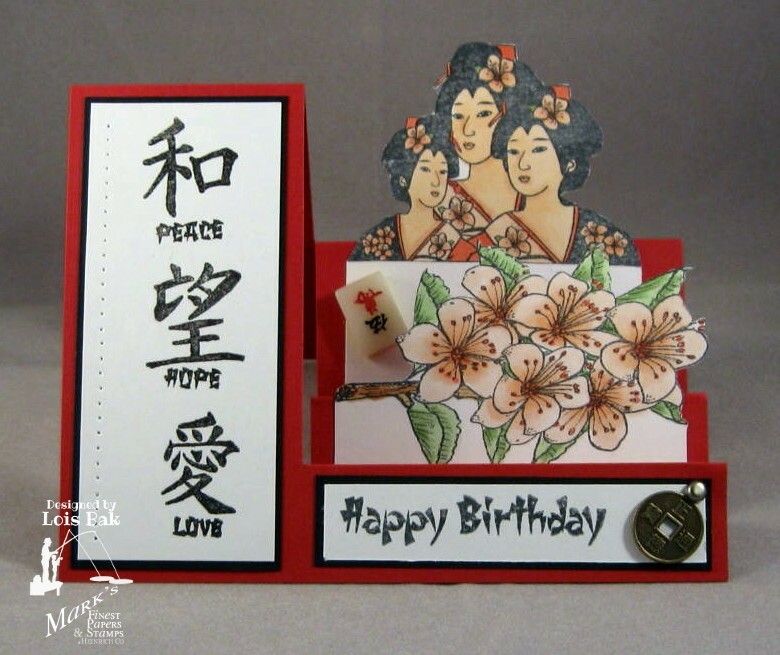 If you decide to make a card for this challenge and post it to another website, such as Splitcoaststampers, be sure to use the keyword CCEE1230 so we can all find it. 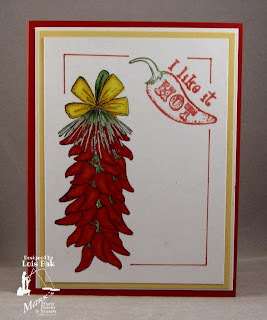 Today's sketch challenge over on Splitcoaststampers was pretty straight-forward. 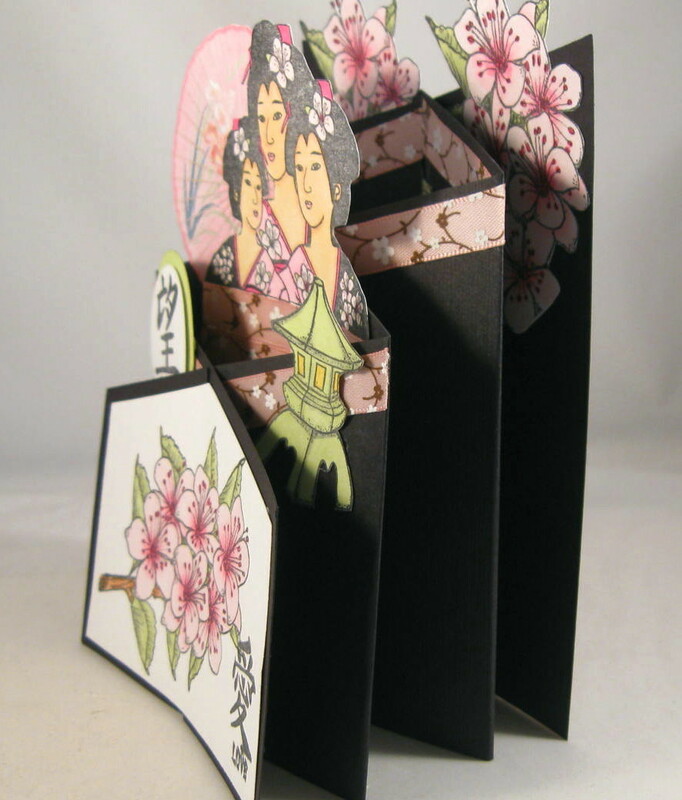 A card with three panels on the front. I decided to take it a step further and combine it with a folding technique -- an Easel Card. I'm still playing around with the new set from Mark's Finest Papers, a Heinrich Company, called Be Wild and Free. On many of the cards I have made with this set, I've created that orange sky behind the "serengeti" tree (which is actually an acacia tree) -- which is frequently pictured in African photographs. Using Tim Holtz Distress inks (Scattered Straw, Wild Honey, Dried Marigold, Spiced Marmalade), I sponged a piece of white cardstock and then cut a piece of DP from DCWV's Safari Chic pad for the bottom panel. Lining up the DP with the "sky," I stamped the tree and animals in Versafine Onyx Black and embossed it with Detail Black embossing powder. Then I cut the panel into three pieces -- for the layout of the challenge. The base of the easel is another piece of DP from Safari Chic, and I added the two jumbo brads to hold the easel up. 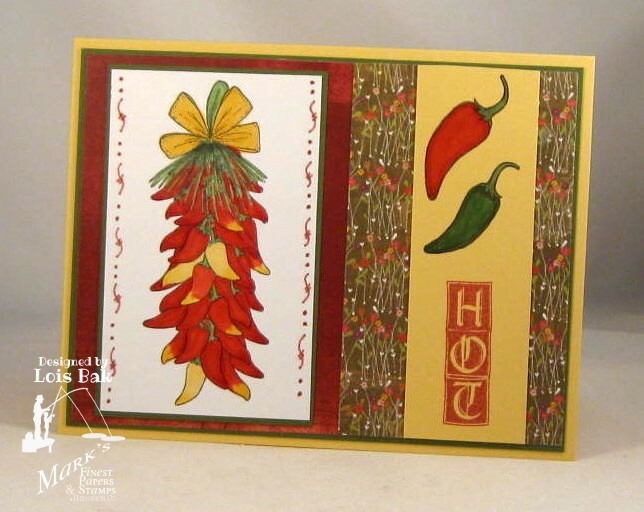 If you've never made an easel card, they are really lots of fun. Here's a link to a tutorial on Splitcoast. Give it a shot! Thanks for stopping by my blog today. I hope you come back again soon. And don't forget, I have a project for the MFP Christmas in July blog hop on Friday. Welcome to Mark’s Finest Papers, a Heinrich Company’s Christmas in July blog hop! We are so glad that you joined us. We hope that you will enjoy the tutorial each day and the projects on each of the blogs. The blog hop will run July 23-29, with a new tutorial and project each day of the hop. Please note, if you are not a member of Speedy TV you will need to join the site before you can view the tutorials. Joining is quick, easy and FREE, just click the tutorial link below and it will take you right to the home page where you can join. The sign up button is on the right hand side of the page. Below are the designers participating in the hop. Some may have a project each day and some may not. I used several of the cardinal images from Christmas Cardinals, along with several different supplies from one of the MFP Premium Paper Craft Packs. If you haven't gotten one of these packs, you're missing something. 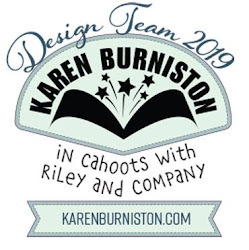 They include cardstock, coordinating designer papers, and lots of embellishments. Everything you need (except adhesive) to make quite a few different cards. 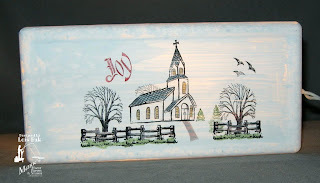 Thanks for stopping by my blog during our Christmas in July celebration. I'm participating in a total of four of the hops, so I hope you come back again soon. I'll have projects on Friday, Saturday, and Sunday. Please hop along with us! You have a chance to win one of the above stamp sets! Just comment on the blogs listed below(don't forget this one) each day for more chances to win! (You do NOT have to comment on all the blogs each day! The names are drawn randomly!) 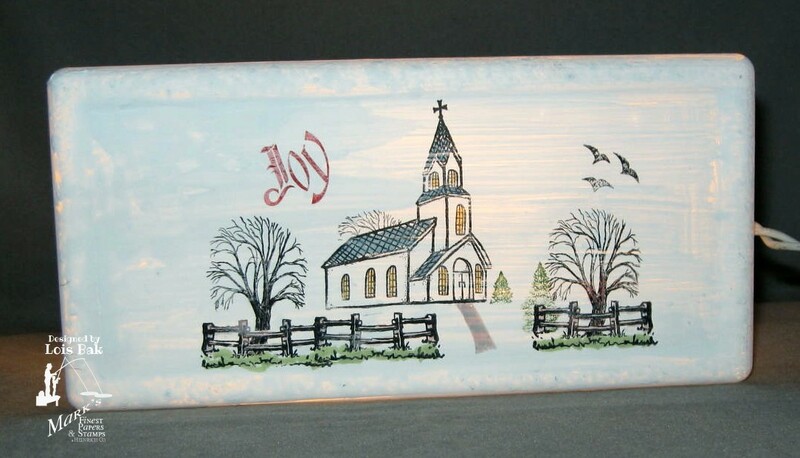 All four winners will be announced on July 21, 2012 on the Mark's Finest Papers blog. You can go back and comment if you missed a day. (HINT: The more you comment, the more chances you have to win and comments on the MFP blog count twice!) The deadline for commenting is 11PM EST on Friday July 20, 2012. Here we are on the last day of the MFP Blog Hop. I hope you have gotten some inspiration from the design team. While my first card is technically a clean and simple one, it does have several layers. My second card is a step card, but a little different than the others I made this month. The steps are in the center. I saw this type of card at a recent stamp show and thought I'd like to give it a try. My friend's kitchen is decorated with items painted with chili peppers. I thought I'd give her these two cards in case she needs a few more! Be sure to check out the rest of the design team members' blogs to see what they did with this "hot" set. And make sure you comment for your final chance to win a free stamp set this week. Please hop along with us! You have a chance to win one of the above stamp sets! Just comment on the blogs listed below (don't forget this one) each day for more chances to win! (You do NOT have to comment on all the blogs each day! The names are drawn randomly!) All four winners will be announced on July 21, 2012 on the Mark's Finest Papers blog. You can go back and comment if you missed a day. (HINT: The more you comment, the more chances you have to win and comments on the MFP blog count twice!) The deadline for commenting is 11PM EST on Friday July 20, 2012. My first card today is for both the MFP Blog Hop and the CCEE stampers challenge. I am the CCEE challenge hostess for the month of July and asked the team to make a card using two different border punches on their cards. This little garden gnome is adorable, don't you think? I may be stretching the definition of "clean and simple" on my second card. Although there is a lot of "white" space, it wasn't so simple to make. 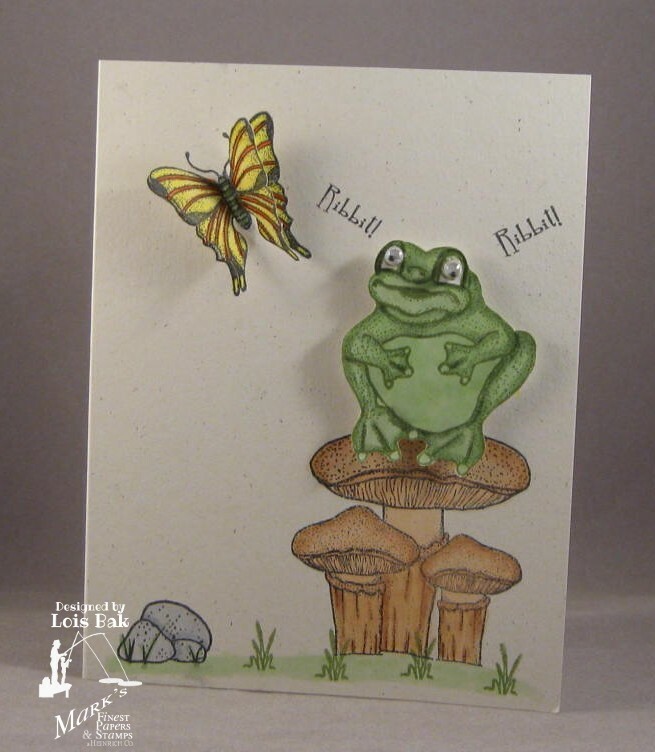 I did cut out the frog and pop him up on those mushrooms -- adding the googlie eyes. The butterfly was stamped twice, once on the card and once on a piece of scrap paper. I cut out the second butterfly and popped him on top of the the first one. Both of my cards also included images from another MFP set called Scenic Selections -- the birds in the first card and the rock and grass in the second one. Again I've got a relatively clean and simple card for today's set. After stamping the tree, I masked the card base using a Spellbinders die and sponged in the sky. I then added the animals and the sentiments, then drew the frame. I must be in a rut because my second card is another side step card. The giraffe and tree image is actually from the 5th stamp set for this month. It's called Above the Rest and coordinates very nicely with Wild and Free. The sentiment is actually longer than what appears on my card, but it was too long to fit in the space. I think the shortened version still conveys the message! 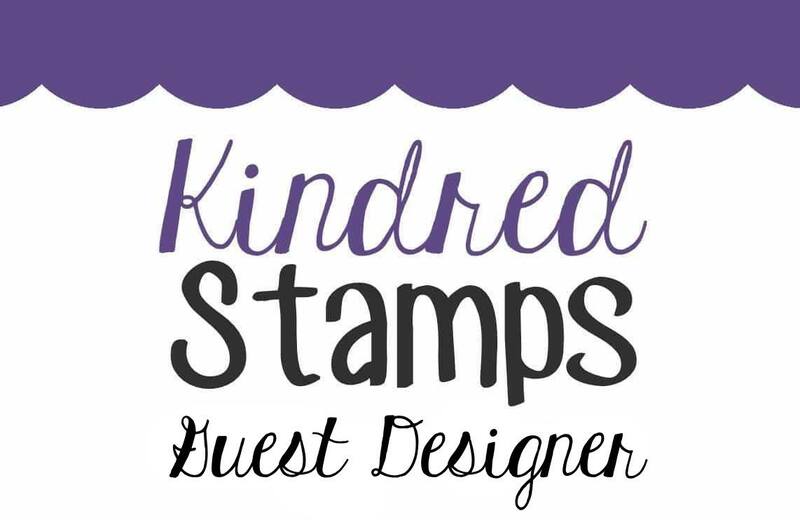 Don't forget to check out the rest of the team members' blogs and comment to win a free stamp set. Please hop along with us! You have a chance to win one of the above stamp sets! Just comment on the blogs listed below (don't forget this one), each day for more chances to win! (You do NOT have to comment on all the blogs each day! The names are drawn randomly!) 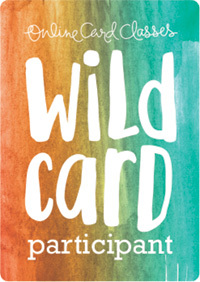 All four winners will be announced on July 21, 2012 on the Mark's Finest Papers blog. You can go back and comment if you missed a day. (HINT: The more you comment, the more chances you have to win and comments on the MFP blog count twice!) The deadline for commenting is 11PM EST on Friday July 20, 2012. My first card for today is a clean and simple one. I added a few score lines to separate the oriental symbols and the cherry blossoms. My second card is a side-step card, which is always fun. I used several of the images from today's set. In addition I added an oriental coin. Be sure to check out the blogs listed below. The more you comment, the more chances you have to win a free stamp set. 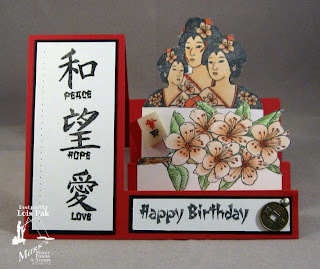 Last year one of the Technique Lovers' Challenges on Splitcoaststampers was a very cool technique -- a cascading card. I've been itching to make another one for a while. Today was the day I scratched that itch. I thought one of the new sets from Mark's Finest Papers, a Heinrich Company, Asian Delights, would lend itself to this technique. I stamped several of the images from this set, cut them out, and strategically placed them on the card, along with some cherry blossom ribbon I happened to have. The parasol was a royalty-free photo I found on the internet. You can see the cascading effect on this side view. This pretty stamp set, along with four others, will be available starting on Tuesday. 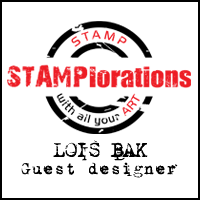 Be sure to check the Blog Hop all next week to see how you can win some free stamps. My card is a sneak peek at a new stamp set from Mark's Finest Papers, a Heinrich Company, which will be released next week. It is called Be Wild & Free. 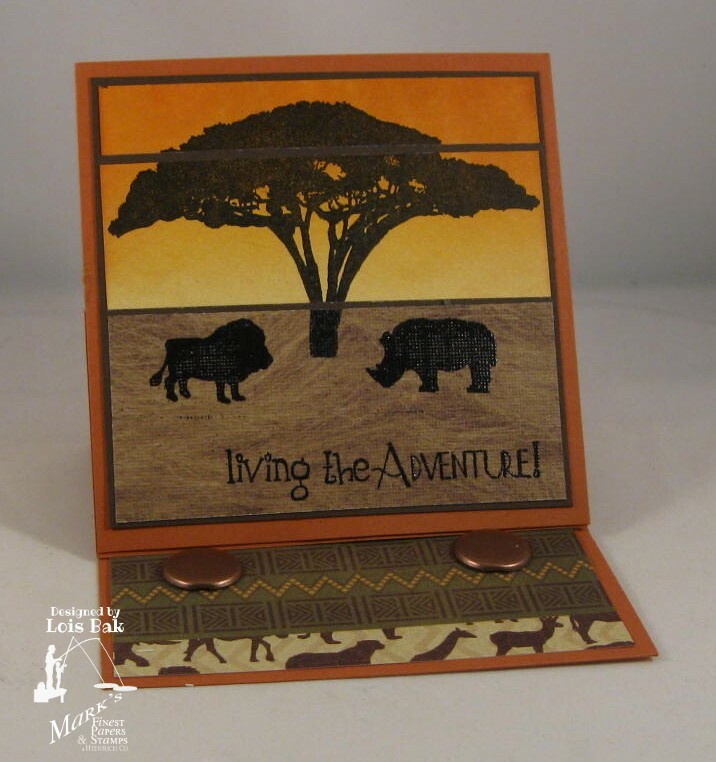 Included in the set is a most-familiar African tree, which is what I used on my card. 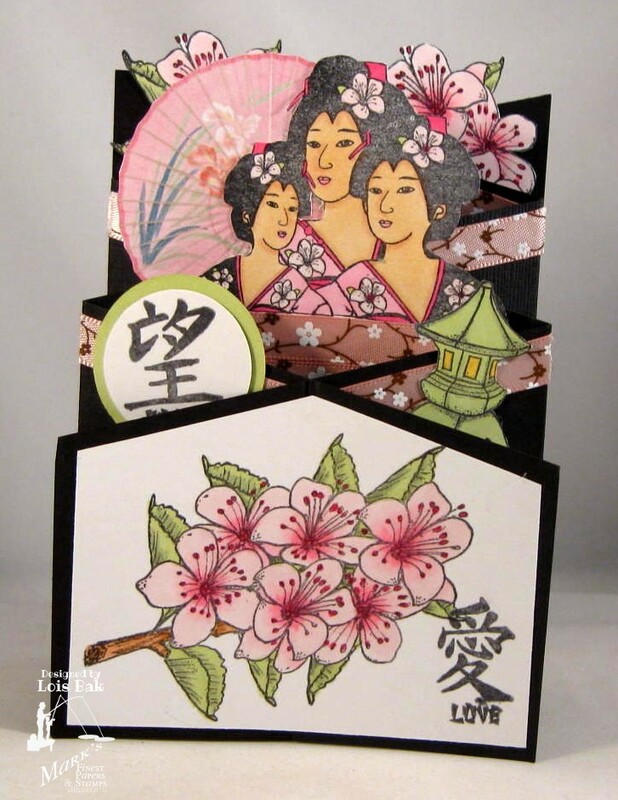 To make this card, I first cut out an opening in a piece of Eclipse Tape using the third largest Large Petite Ovals nestabilities die and then sponged on the background color. 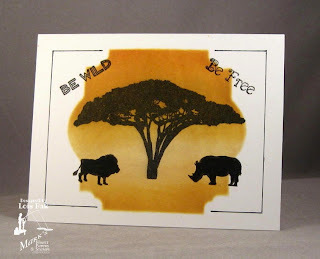 I used four different Tim Holtz Distress inks -- Scattered Straw, Wild Honey, Crushed Marigold, and Spiced Marmalade. Whenever I remove the Eclipse Tape mask, I am always amazed at how dramatic it looks! 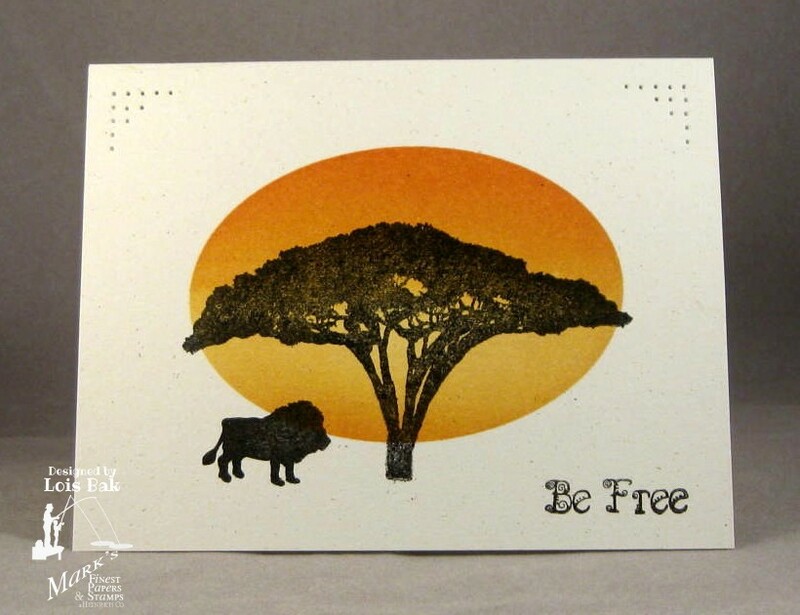 I then stamped the tree, the lion, and the sentiment in Versafine Onyx Black. One trick I've learned when using silhouette clear stamps is to rub a white eraser on the stamp to "rough up" the surface. The ink seems to grip better, and you get a much cleaner image. All that was left was to pierce the corners, and voila -- I was finished. We'd love for you to play along with the CCEE team. 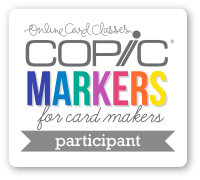 Just make your card and upload to the CCEE blog using Mr. Linky at the bottom of the post. I wound up doing both of the new challenges (Sketch with a Twist and Simple Salutations) over on Speedy TV today. The sketch challenge was posted yesterday, but I didn't have a chance to do it then. I used one of the stamp sets that will be released next week, Hot & Spicy, to make my card. This is the HOT part of my post today. 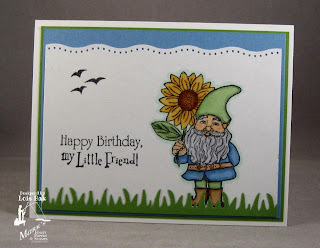 The card base is MFP Morning Sun and the background DP comes from two different Basic Grey paper pads -- Wassail and Green at Heart. 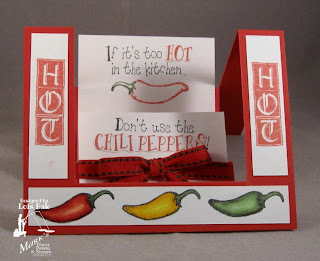 The string of chili peppers looked a little stark on that white panel, so I added some doodling down the sides. The COOL part of my post is the Simple Salutations challenge. This week's theme was "Beach." 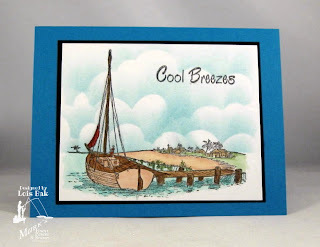 The MFP set, Island Life, seemed like the perfect set to use on this card. 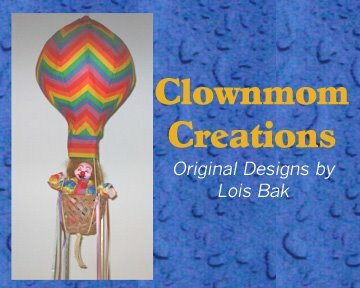 I recently attended StampFest Orlando, a show I really like. I found this cloud template in one of the booths. I'm still working on how to space the clouds in the sky, but I'm getting there. Thanks for stopping by my blog today. I hope you try one or both of these challenges. 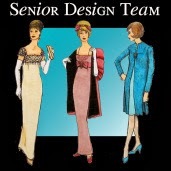 Each week the hostesses choose a winner to receive a free Mark's Finest Papers, a Heinrich Company, stamp set. 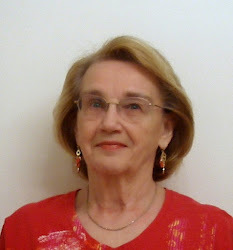 I'm the hostess for the month of July over on the CCEE challenge blog. For my first challenge of the month, I asked the team members to make a card using three circles anywhere on their cards. It's not exactly a sketch challenge, but you should find at least three circles on everyone's cards -- plain circles, scallop circles, whatever! For my card I made an circle easel card. Masculine cards are not always easy, but this image from Mark's Finest Papers, a Heinrich Company (from a set called Island Life) made it relatively simple. I had made easel cards before, but most of them were either square or rectangular. This might have been the first round one I made. Because I wanted it to be a masculine card, I didn't put much in the way of embellishments on it -- just the brad holding the easel up. I don't know if you can see it, but I pierced around the outside circle -- using a piece of plastic canvas as my template. We'd love for you to play along with the blog team. 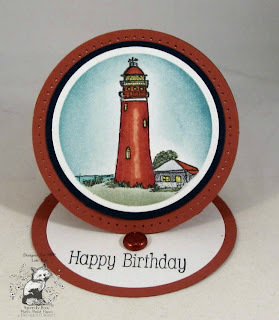 Just make a card using at least three circles and post it to the CCEE blog. There's a new challenge over on Speedy TV. It's called Simple Salutations -- a clean and simple challenge with an additional requirement: there needs to be a sentiment on the card. Today's challenge is to use an animal -- a real one, not a fictional or toy one. Birds are animals, right? 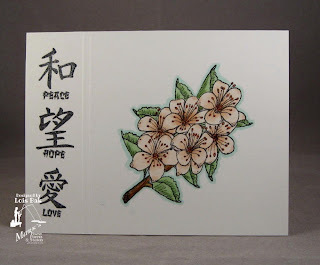 I just bought this pretty embossing folder last week, and this is the first time I've used it. It's a Sizzix folder. See how nice and crisp that embossing is? What I like about the Sizzix folders is that the back half is recessed enough that you can fold it over a one-layer card and fold the card in half to run it through your Cuttlebug or Big Shot. I thought it framed the cardinal nicely. I have thoroughly fallen in love with this chubby little cardinal from Mark's Finest Papers, a Heinrich Company. I hope you stop by Speedy TV and check out the challenges. There is one almost every day. Look at all the chances you have to win a free stamp set. Not a lot is free these days!